Yamaye: Cannibals in the Caribbean? Images: (Top) Early Print of a Carib Family. (Middle) Maligned heritage: 1992 photograph by Michael Auld of an Island-Carib girl from the Carib Reserve in the Eastern Caribbean Island of Dominica. Both Walt Disney Pictures and Columbus defamed her people. The Carib Reserve is the only Indigenous American reservation in the Caribbean. Jamaica has two historic African (Maroon) “reservations”. (Bottom Left) Imaginary cannibalism: Early European illustration of an imaginary scene of Carib “cannibalism”. (Bottom Right) Real cannibalism: Pot polished and beveled human bones. 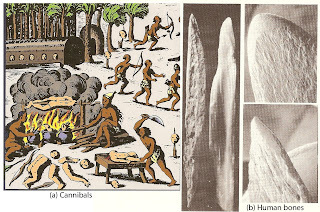 Human bones from Mancos Canyon, Utah showing evidence of actual cannibalistic cooking. cannibal, /kánnib’l/ n. From Mid 16th century Spanish canibales. 1. Somebody who eats human flesh, whether for food or as part of a religious ritual. 2. An animal that eats the flesh of other animals of the same specie. Cannibalism is historically one of the most feared and reviled human practice. Yet the glorification of one of the forms of cannibalism, human blood drinking, is now a popular HBO Television series called “True Blood”. Cannibalism is deeply embedded in our psyche. For example, Christians perform a form of ritual cannibalism by drinking wine or grape juice that symbolizes the “blood of Christ” and eating bread that represents his body. Cannibalism occurred in all areas of the planet and is still an isolated phenomenon within some contemporary “Developed World” societies. In many of these countries there are no laws against cannibalism. It is as ancient as the Neanderthal and as recent as America’s Jeffery Daumer and Germany’s 41-year-old computer technician Armin Meiwes. The gruesome European illustration above shows brown skinned “natives” dismembering white victims while their women cook body parts in pots and on a spit. Three heads are placed on spikes in the custom of a 16th century European practice. This early propaganda illustration depicted the unfounded Euro-centric fear that was pervasive in Europe after Columbus arrived in the Caribbean in 1492. Although he had not seen cannibalism during his many years in the Caribbean, he instigated a myth that served the goal of Spanish expansionism in the Americas. His exploits enriched Spain and ultimately Western Europe. Unfortunately the contemporary descendants of the Island-Carib on the Eastern Caribbean Island of Dominica still continue to suffer humiliation from Columbus’ 500-year-old lie. In 1992 an aid to the Carib Council on Dominica’s Carib Reserve related to me her continued plight. She spoke of how she had to defend herself against an African-Dominican assertion that her ancestors were cannibals. The elected chief then also related how non-Carib Dominicans would cross the road so as not to walk on the same side as a Carib. His preferred name for his people was Karifuna. Today they are also called Kalinago. Disney added to this dilemma when it made the most recent sequel of Pirates of the Caribbean: Dead Man’s Chest by portraying Dominica’s Island-Caribs as cannibals. Prior to filming, despite protests from Native American groups, Disney continued with its project. The sequel was a commercial success. These misleading movie images may be forever burned into the minds of future generations. The National Garifuna Council of Dominica criticized the movie for “portraying the Carib people as cannibals”. How did this Caribbean myth begin? Dr. Basil A. Reid a Jamaican anthropologist who teaches at the University of the West Indies in Agustine, Trinidad and Tobago has published evidence that refutes the notion of Caribbean cannibalism. In his 2009 book Myths and Realities of Caribbean History he attributed this myth to Christopher Columbus. According to a November 4  quote in Columbus’ diary, “He [Columbus] understood also that, far from there [the Bahamas? ], there were one eyed men, and others, with snouts of dogs, who ate men, and as soon as one was taken they cut his throat and drink his blood.” Today it may not be difficult to accept that 15th century Europeans who thought that the world was flat also believed in fairies, mermaids and gigantic sea serpents. Dr. Reid suggested that the source of Columbus’ “New World” propaganda is contained in the following. Cannibals: Natives who refused to submit to the Spanish were called cannibals. They were characterized as idolaters and consumers of human flesh who could not be converted into Christianity and were therefore suitable for enslaving. 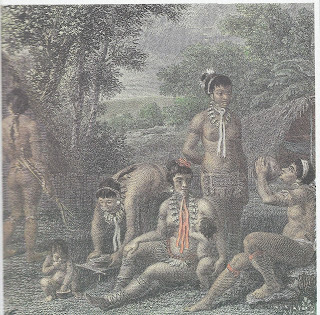 Caribes: The Spanish understood Caribes [pronounced ka-rib-hes] to be real people when in fact they were creatures who existed only in Taíno mythology. Caniba: Columbus sought an audience with the Grand Khan of Cathay (China). Caniba is the name Columbus gave to denote the Grand Khan’s subjects. Greek mythology also had Cyclops and cannibals. It should be remembered that until his death Columbus insisted that he had indeed arrived, explored, ruled over and lived among these Chinese or Indian Asians in the Caribbean Islands. When he first arrived in Cubanacan (Taíno word for Cuba) he sent out an inland exploratory party to find the Grand Kahn’s kingdom. Ironically, Cuban-a-kan did sound like “Kahn”. Were the people of Cuba and Haiti cannibals? In 1492, the indigenous people of Cuba and Haiti belonged to the extensive Taíno civilization, rivals of the Eastern Caribbean’s Island-Carib. The more diplomatic Taíno cacicazgos (chiefdoms) were not the warrior society of the Island-Carib. Hola, muy interesante los temas tratados. Soy la alcaldesa del municipio de San Juan de La Maguana en La República Dominicana, ubicada en el mismo centro de la isla. Cuna del cacicazgo de Maguana. En el año 1998, participe en las excavaciones donde hayamos un enterramiento de un caníbal, con sus objetos y enseres. Es el hombre mas antiguo de la isla y se encuentra en esta ciudad. Llegamos hasta el, porque se hacia una construcción y aparecieron muchos huesos humanos, calcinados.